At Cullenberg & Tensen, our track record of successful verdicts for our clients’ is a testament to the way we treat each case. Every client has a unique story to tell. We understand the tremendous stress a legal battle causes. You want someone you can trust. The attorneys at Cullenberg & Tensen engage our clients’ as members of the team, taking part in every significant decision. These are decisions that will affect your life and you want representation that understands all that is at stake. Using innovative techniques and technologies, we are able to offer the best representation possible in the Vermont & New Hampshire area. We are experts in the courtroom. We have a well-planned strategy ready before we step foot before a judge. We find key witnesses and documents, and then focus our efforts on how to present targeted depositions and discovery. We know how to communicate complex ideas to judges and juries. We offer aggressive high-quality representation to victims and families who have lost loved ones in accidents or have suffered serious injuries throughout New Hampshire and Vermont. By fully aligning our clients’ interests with our own, we are able to focus on success. From the free consultation throughout the case we work diligently to make certain this will not put any further monetary strain on you and your family. Our focus is not on the billable hour, our priority is to give cost-effective resolutions working on a contingency fee basis. You will incur no legal fees unless you recover money for your damages. 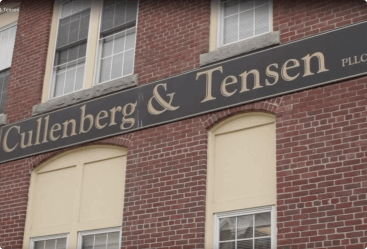 Contact Cullenberg & Tensen today to set up your free personal injury consultation. We serve clients’ throughout Vermont, New Hampshire, New York, and all across the country. Please contact our NH & VT Accident Lawyers at the law offices of Cullenberg & Tensen, P.L.L.C. today to set up your free personal injury consultation. We serve clients’ throughout Vermont, New Hampshire, New York, and all across the country. Both founding attorneys are proud to be longstanding members of the North Country community, and we understand the needs of local folks. We have a full support staff, which includes highly talented paralegals, and legal assistants. As a small firm that gets big results, we do not back down. When you hire Cullenberg & Tensen, P.L.L.C., you get a team of personal injury professionals dedicated to making sure you receive the compensation you deserve. We work on a contingency fee basis, so you will not have to pay any legal fees unless you recover money for your damages. VT & NH personal injury lawyer David Cullenberg brings his background as a Vietnam veteran with military intelligence experience to work for his clients. He has been able to translate the toughness and aggressiveness he learned from years of military service into tenacious legal representation for his clients. Vermont personal injury lawyer, Arend Tensen has extensive experience working on farms and currently owns and operates a farm. His unique insight into farm injuries helps him provide superior representation for farm accident claims. He has handled hundreds of personal injury cases. If you need experienced legal guidance, look no further than the Northern New England law firm of Cullenberg & Tensen, P.L.L.C. When you hire our knowledgeable NH & VT personal injury Lawyers , you can be sure that our 50 years of combined legal experience will be strategically used to ensure you receive the greatest likelihood of a successful resolution to your case. Our goal is to stand up for the rights of everyday people who deserve to be heard by the justice system. Our legal team will do whatever it takes to get you a fair outcome. We are ready and willing to go to trial if necessary, a move that is often warranted when insurance companies fail to make fair settlement offers. If you need experienced personal injury representation, Cullenberg & Tensen, P.L.L.C. will not let you down. Please contact our VT or NH Accident lawyers at Cullenberg & Tensen, P.L.L.C. today to schedule a personal consultation. We represent real folks – everyday people who have nowhere to turn and need legal guidance that is shaped with their best interests at heart. We represent the working class and stand up for individuals who look to our attorneys to follow up on important aspects of their case. We have multiple locations to reach as many clients as possible and to make our legal services convenient and accessible. Our main office is in Lebanon, New Hampshire, along with our satellite office in Littleton, New Hampshire. Our small but powerful firm consists of lawyers who help people like you every day. We make our legal services accessible to people who truly and sincerely need help fighting to recover for their injuries against insurance companies. We understand the needs and struggles of North Country families. We are a small firm, but we get big results. If you cannot come to us, we will be happy to go to your home, workplace, or hospital for a personal legal consultation. We are a full-service personal injury firm, so we can take on any case that has resulted in serious or life-threatening injury. Our New Hampshire personal injury lawyers work on a contingency fee basis, which means you pay nothing until you collect a settlement. If you are considering filing a claim against someone who wronged you, please contact our Vermont and New Hampshire personal injury lawyer offices today for a confidential consultation. We serve clients’ throughout Vermont, New Hampshire, New York, and all across the country.